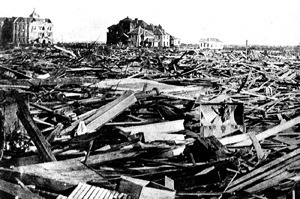 The Hurricane of 1900 made landfall on the city of Galveston in the U.S. state of Texas, on September 8, 1900. It had estimated winds of 135 miles per hour (217 km/h) at landfall, making it a Category 4 storm on the Saffir-Simpson Hurricane Scale. The hurricane caused great loss of life with the estimated death toll between 6,000 and 12,000 individuals; the number most cited in official reports is 8,000, giving the storm the third-highest number of casualties of any Atlantic hurricane, after the Great Hurricane of 1780 and 1998’s Hurricane Mitch. 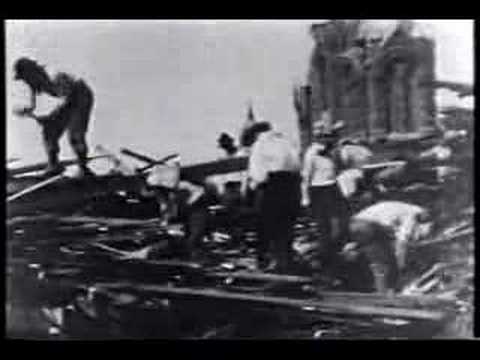 The Galveston Hurricane of 1900 is to date the deadliest natural disaster ever to strike the United States. 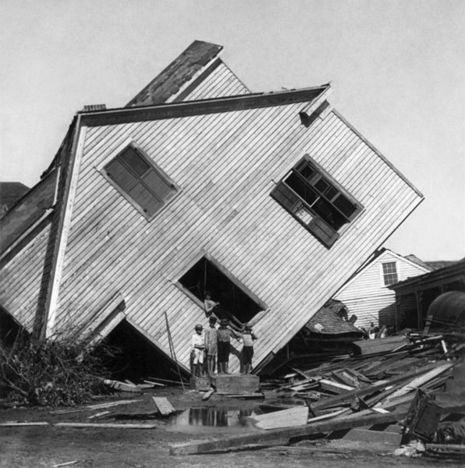 By contrast, the second-deadliest storm to strike the United States, the 1928 Okeechobee Hurricane, caused more than 6,000 deaths, and the deadliest storm of recent times, Hurricane Katrina, claimed the lives of approximately 1,800 people. In Galveston on the rain-darkened and gusty morning of Saturday, September 8, 1900, newspaper readers saw, on page three of the local Daily News, an early-morning account of a tropical hurricane prowling the Gulf of Mexico. On the previous day Galveston had been placed under a storm warning by the central office of the Weather Bureau (now the National Weather Service) in Washington, D.C. A one-column headline announced, "Storm in the Gulf." Under that, a small subhead proclaimed, "Great Damage Reported on Mississippi and Louisiana Coasts-Wires Down-Details Meagre." Galveston's leaders took several major steps to recover from the storm and to prevent a recurrence of the devastation. A brief description of Galveston Island will not be out of place as introductory to the details of this disaster. It is a sand island about thirty miles in length and one and one-half to three miles in width. The course of the island is southwest to northeast, parallel with the southeast coast of the State. The City of Galveston is located on the east end of the island. To the northeast of Galveston is Bolivar Peninsula, a sand spit about twenty miles in length and varying in width from one-fourth of a mile to about three miles.